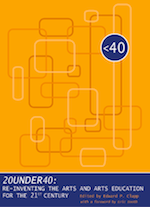 Even before its official release, the 20UNDER40 anthology had been making a buzz in the media. Check out the links below to view some of the attention the book has received in print and through online media venues. If you are a blogger or member of the press interested in writing a review of the anthology or conducting interviews with either the editor or one of the 20UNDER40 authors, please direct your inquiry to: editor (at) 20UNDER40 (dot) org. Is the imaginative child an endangered species? In a provocative new book, Bridget Matros, cocreator of the Art Studio at the Boston Children’s Museum, asks that question and suggests ways to address the creativity deficit she sees in children and adults. Her essay appears in the anthology “20Under40: Re-Inventing the Arts and Arts Education for the 21st Century” (AuthorHouse).… In “Handprint Turkeys and the Cotton Ball Snowman: Is There Hope for an Artful America?” Matros writes about young children who, when asked to suggest an alternative use for an egg carton, “struggle to imagine. This, to me, is astounding, and gravely problematic.” She points a finger at adults who teach children that art should conform to a narrow set of rules. About two days ago I finished reading 20UNDER40, the collection of 20 essays on the topic of creating change in the arts sector written by people under 40 years of age.… It’s an important contribution to the conversation about where the arts are going, and I don’t think anyone should question that.… I’m truly pleased to see that people under 40 are getting their say in this book. I was never in the least concerned that people over 40 were not invited; that’s a good thing. If I could financially swing retirement tomorrow, I would gladly step aside for these people (ah, there’s the rub). They would then have the time they need to effect their changes. And I do recognize that the editor and the writers recognize that their collection has its limitations – it’s a start at the very least. Dissemination of these ideas across demographic boundaries will be key. I only hope they will have the time it takes in this fast-paced society we have created to achieve their goals. Reinventing the arts and arts education is not just about new business models. In the collection, there are punchy essays about the way art school students are graded, why contemporary dance is losing its expressive power, and why 21st-century arts educators should teach computer programming…. Although much of the book is dedicated to expressing frustration with the status quo, there is a high level of optimism about the future. That optimism is grounded in a faith that technology can be used much more creatively; that nonprofit and for-profit business models can be successful; and that Gen Xers and Millennials are going to get their art fix with or without established arts organizations…. 20Under40 puts new ideas from younger professionals on the table. Now the question is: Who will pick them up? Now we move to the second chapter, “The Epoch Model: An Arts Organization with an Expiration Date,” by David J. McGraw…. The abstract for the chapter should raise eyebrows — in a most exciting way. It challenges the received wisdom that nonprofit arts organizations last (and should last) eternally. How this became the prevailing wisdom is [an] important question, perhaps only answerable by future cultural historians. Certainly a nonprofit business model that prizes sustainability over effectiveness is one factor. As McGraw indicates, [there] may be other factors as well.